In medium nonmetal bowl, combine sliced fruit, amaretto and sugar; toss gently. Let stand at room temperature for at least 1 hour before serving to marinate. Heat waffle iron. In another medium bowl, combine pancake mix, water, oil, almond extract and egg; stir just until large lumps disappear. Spray waffle iron with nonstick cooking spray. Spoon half of batter into waffle iron; bake until steaming stops and waffle is golden brown. Repeat with remaining half of batter. To serve, divide each waffle into 4 pieces; place each on individual dessert plate. 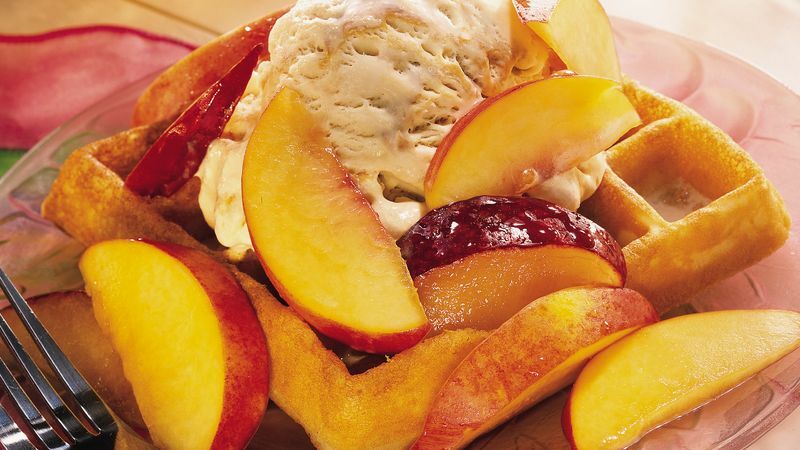 Top each with 1/2 cup ice cream and 1/2 cup fruit mixture with juices. If desired, omit the amaretto and use 1/4 cup apple juice plus 1/4 teaspoon almond extract. To make scooping ice cream a breeze, place it in the refrigerator for 30 minutes before serving. Make the waffles early in the day; let them cool. Store the waffles, loosely covered, at room temperature. If desired, warm them briefly before assembling the dessert.